My mother and I had a lovely Thanksgiving though nothing about the day was as usual, as planned, or as expected. She’s been worryingly logy the last couple of weeks and I’ve had some kind of bug that’s had cold symptoms and bronchial symptoms coming and going and an unreal level of fatigue every day during the same couple of weeks — possibly we both have a bug. Anyway, we planned out a menu of our usual Thanksgiving dinner, minus a dish or two in an attempt to simplify but by Wednesday we hadn’t even gotten the groceries. Because of my odd blood pressure ailment, which leaves me light-headed if I stand for very long, I usually fix a big dinner over the course of a week. Grocery shopping all but the freshest stuff in advance, and plotting out what can be cooked first and frozen, what can be made ahead that lasts ok in fridge, etc. All the shopping and all the cooking between Wednesday and Thursday is just not something I can do. So I looked on line to see what I could come up with and realized the local food co-op, of which I’m a member, instead of closing as they used to on Thanksgiving, somewhere along the way started opening and doing up a Thanksgiving feast for their hot bar. I made sure I got over there this morning soon after the hot bar was supposed to be set up and picked up lovely bourbon-brined turkey, several kinds of veggies, dressing, mashed sweet potatoes and pie. We both napped for a chunk of the afternoon and then heated up plates of the goodies I’d brought home and were so pleased. While we certainly prefer some of the things I make and I favor making my own so I can tweak recipes to get rid of wheat and dairy, the meal was excellent, and given how unwell we’d both been feeling it was perfect. What I especially appreciated was our ability to roll with how we felt and what we sensed we could do. I realized that for most of my life I’ve had a big thing about Thanksgiving. As a child we lived reasonably near my father’s closest (in both age and relationship) brother and his family and I SO looked forward to visiting for a few days. Those cousins are the only ones around my age and for me those days were the closest I came to having siblings so I really loved it. The takeaway was that for many years I felt I had to have a major event for Thanksgiving and it meant I often said yes to invitations that left me uncomfortably dining with large numbers of people I didn’t know and feeling a little disappointed that the day didn’t match my expectations of it. My mother and I both LOVE the food of Thanksgiving so it was great that we managed to get a meal we liked with the minimum effort. I’m so grateful to the co-op for the great prep and for providing food I know is always fresh and local when possible. And I’ll be fixing us a meal of some of the things we’d planned when I’ve got some energy back. But I think what I appreciated most was realizing that I let go of putting such a big expectation on how the day had to be or feel. As my draggy-ness wore on and I slowly revised expectations, from picking up a couple of side dishes at Trader Joe’s (happily ensconced in freezer) when I realized I’d not be able to do it all to abandoning the cooking plan altogether, I never felt let down. Never felt that stab of disappointment that I wouldn’t be having the magical meal I’d planned. We had a lovely meal in a warm and cozy house. No one was shooting anyone in the street or dropping bombs nearby. The weather was lovely. After dumping our plan piece by piece, we were both delighted that we managed to pull something together. How could we not be grateful? Thank you God. Thank you Goddess. Started working on Thanksgiving today-- a day later than normal and without all the groceries picked up. Grocery shopping and major cooking all in the same day is a bit much for my stamina. So, the best I can do for today's entry in NaBloPoMo is to say I'm now too tired to write. For once, I have remembered to take pictures as I go along so there will be posts on the Scribblings blog about the menu. It’s the big problem for me with these November daily writing things. I make a big deal out of Thanksgiving and the planning, shopping and cooking goes on for a couple of weeks. I mete it out to suit my health issues and I love to do it — but there’s not a lot left of me for anything else. In honor of the day I’m changing pace a little. Since I think caring for the temple that houses the soul is just as important to the spiritual path as meditating or practicing right speech, I try to healthy up Thanksgiving (by the standards of my most pristine eating friends, this is still a shudder-inducing meal, so be forewarned). I love Thanksgiving and I love the traditional stuff but I’m supposed to avoid wheat and dairy so the main changes I make relate to that but I have lots of little tweaks. I also like to be able to feel good and enjoy the meal and give honor to the abundance on the table so I’ve learned to do some major pacing in order to keep Thanksgiving day as calm as possible. Sunday was dressing day. I made the stuffing recipe that is embedded in this turkey recipe from Barefoot Contessa. However, substitute Gluten Free Bakehouse stuffing cubes (from Whole Foods) which required adding 2 tsp. dried sage and 2 tsp. thyme to approximate the seasoned Pepperidge Farm stuffing. I just made it in a 9 x 13 pan since I wasn’t putting it in roulade. Then divided and put in freezer. Monday was dessert day. Another Barefoot Contessa recipe, gingerbread with orange icing only I made a 9 x 13 cake instead of cupcakes. 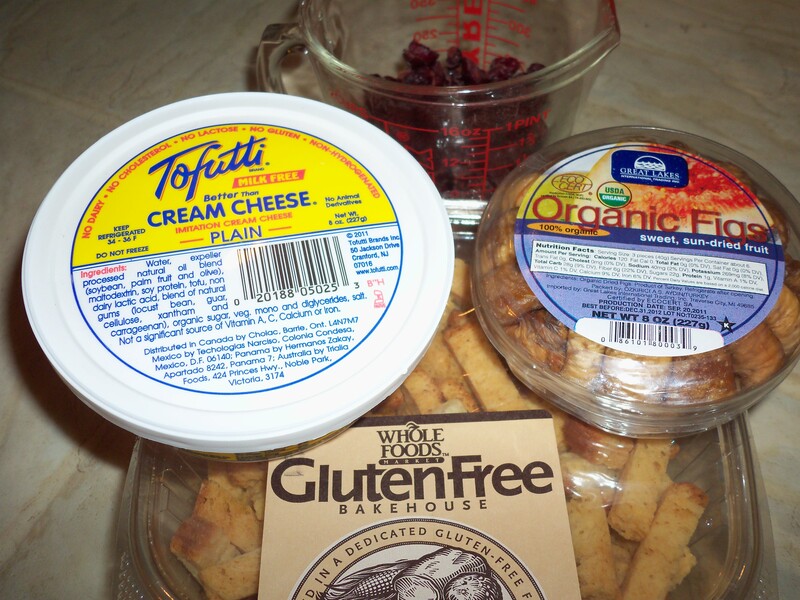 And I substituted spelt flour for wheat flour, and Tofutti sour cream and Tofutti cream cheese. Yummy. Cut it in pieces and laid out on a cookie sheet to freeze – later divided in containers. 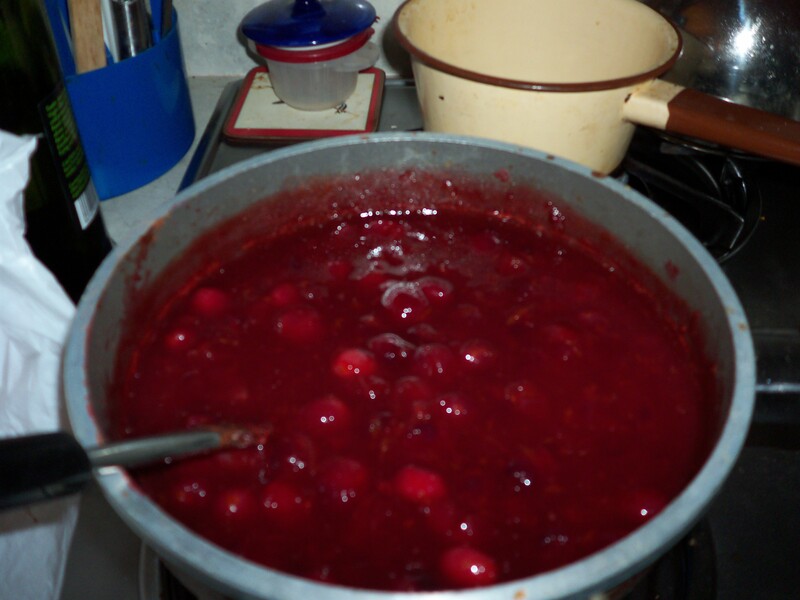 Tuesday was cranberry compote day, using Emeril’s fresh cranberry compote recipe. No need for substitutions except Turbinado sugar instead of white! Wednesday was Smashed Sweet Potatoes and Beaumont Inn Corn Pudding day. 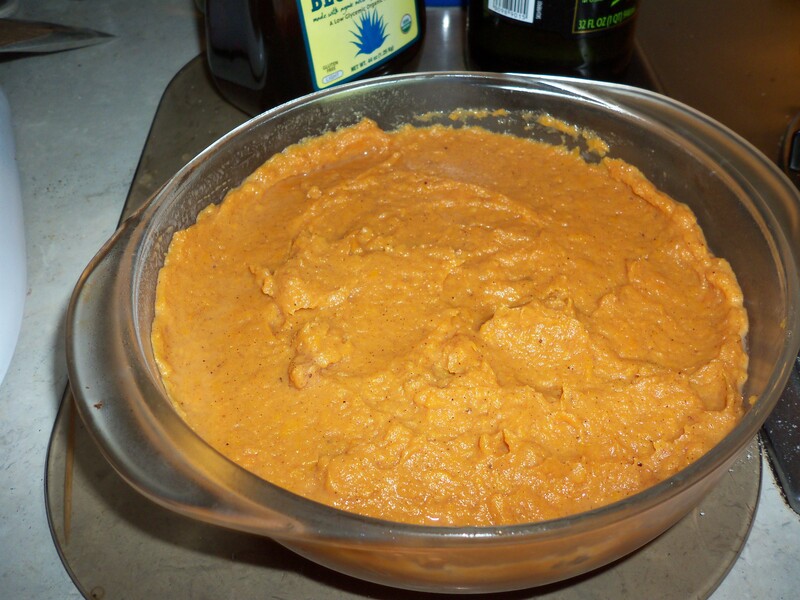 I cook the sweet potatoes and mash with the other ingredients and then wait to cook the rest of the way on Thanksgiving.. I substitute Silk creamer for cream in the potatoes and in the corn pudding use spelt flour, Turbinado sugar, and a combo of Silk creamer and almond milk for the milk. Move frozen items to fridge. Make brine and leave to cool overnight. 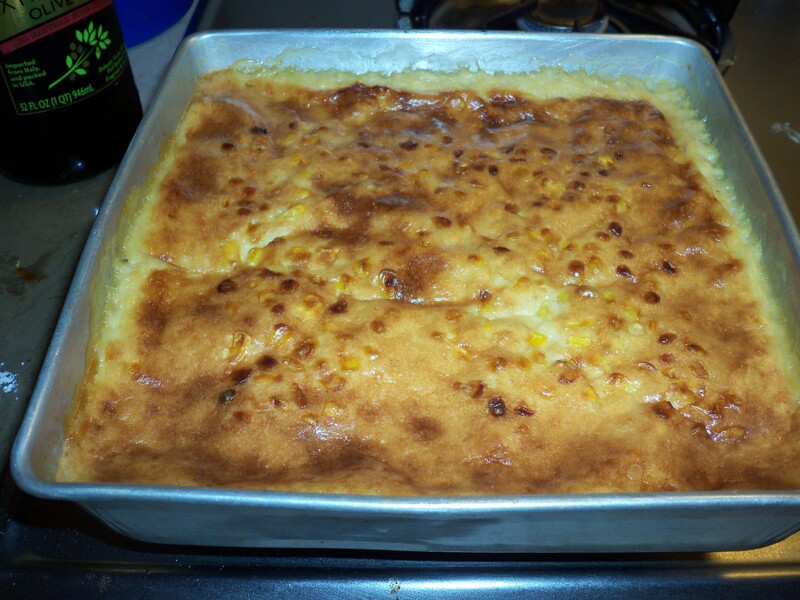 This style corn pudding is a very Kentucky thing — I’ve never met anything quite like it elsewhere. Beaumont Inn is an old institution; I can remember going with my grandmother and parents when we visited as a very small child and it was a historic place then. On Thanksgiving it’s turkey day. Brine first. For the turkey and gravy I’ve long since combined elements from recipes from Tyler Florence, Ina Garten and Rachael Ray. 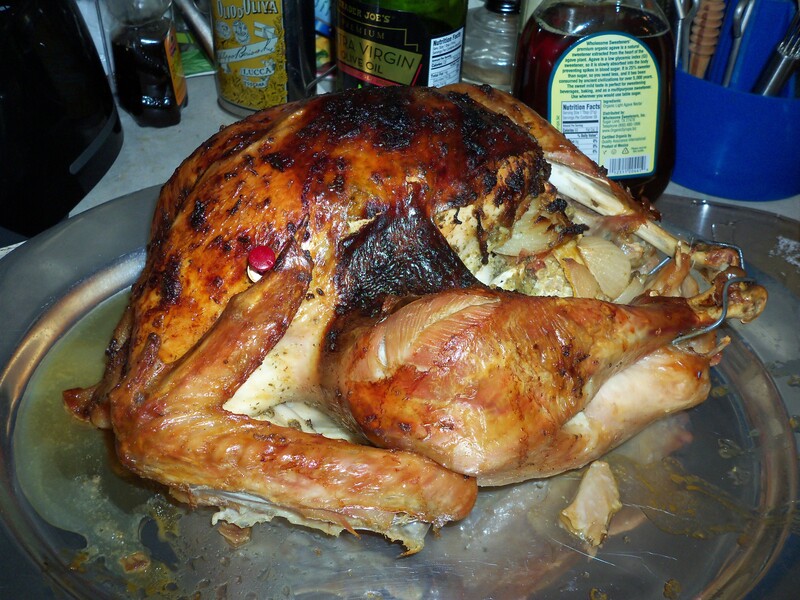 Turkey is stuffed with cut up orange, lemon, onion and head of garlic. Herb paste rubbed under skin and on outside is from this Rachael Ray recipe.. The pan gravy I lift from this Tyler Florence recipe. After spreading the work (and the DISHWASHING) over five days, I’m really calm and collected when it’s time to sit down for the meal and I actually enjoy myself instead of wishing the meal would end so I could lie down. The tweaks make surprisingly little difference to the taste — one of my goals the last several years has been to produce meals that are satisfyingly yummy while still being healthy; while this meal is questionably healthy, it is definitely delicious and healthier than if I didn’t tweak. When I was a kid we had every Thanksgiving with my aunt and uncle and cousins and I loved being a big family for a change. My uncle Bill made up a song that we sang every year (to the tune of Frere Jacques): “Next Thanksgiving, next Thanksgiving, don’t eat bread, don’t eat bread. Stuff it up a turkey, stuff it up a turkey. Eat the bird, eat the bird.” We may not have been reverent but oh did we laugh. Miss you Bill. Hope you all had a beautiful and relaxing day! 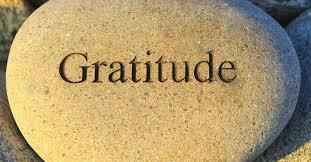 Thanks for reading my blog and to those of you who spark my interest every day with your posts, thank you so much!